News is out all over the web... Starting in May 2016 - Google is saying that non-mobile friendly websites will fall back and be penalized in search engine rankings. It's true! 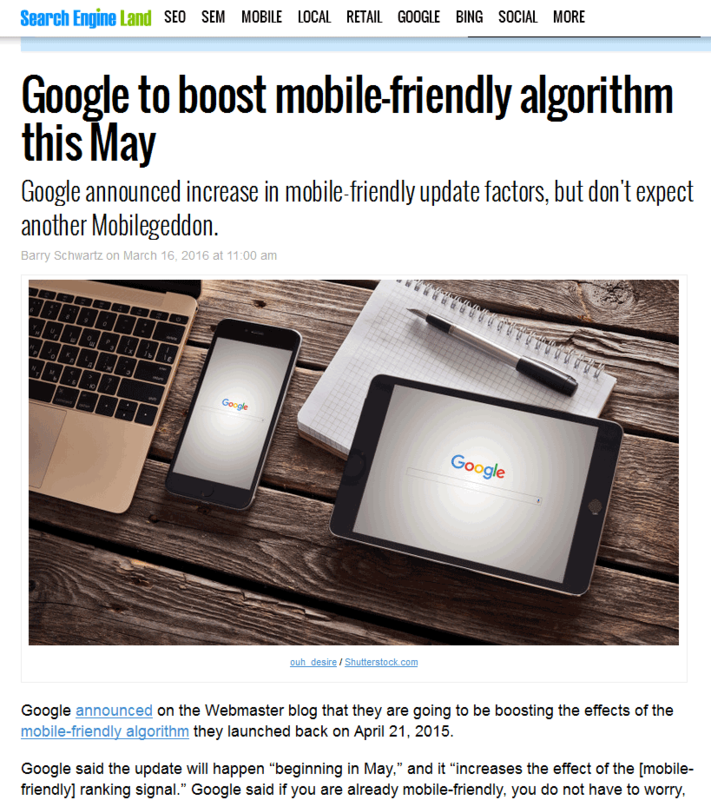 ...Google is about to put the nails in the coffin for all websites that are not "Google Mobile Friendly." They not only announced it on their own website, but they have even made a special page for you to TEST your website. Step 1: Take the Google Mobile Friendly Test – See for yourself. 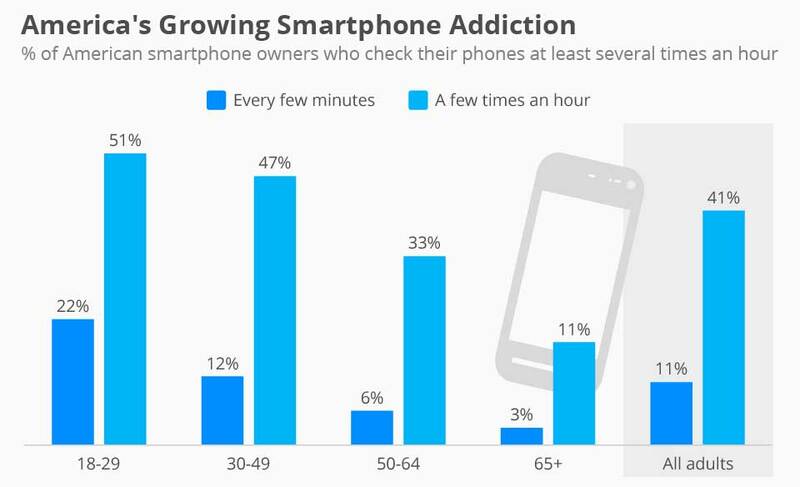 Very simply put – your website is either mobile friendly or it is not. 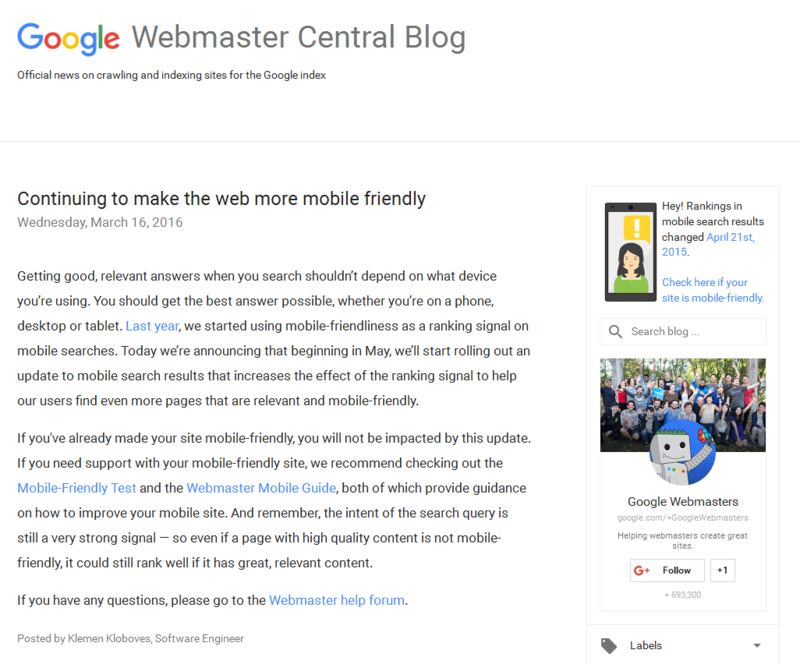 Click here to take the Google Mobile Friendly test right now. Simply enter in your URL (domain name) in this format: http://www.yourdomain.com …and then click the ANALYZE button. The test will take about 30 seconds max – and then you’ll know straight from Google if your website passes the test or not. Step 2: Decide that you want the best for your business. Your business is your lifeblood and your business is what keeps you from working for another person’s business. Your business is what gives you more freedom, more family time, and the ability to call your own shots. But your website is an extension of your business – and if your website fails – it can drag your business down with it. Step 3: Decide that you want US to help you fix your site. Let’s face it – How many other local SEO agencies have contacted you to tell you that your site is broken in the eyes of Google? How many other SEO agencies have LIVE PROOF OF THEIR RANKINGS on their website for all to see? How many other SEO agencies have built a page on their website just to help businesses like yours get out of a Google penalty? We DOMINATE our competition and now is your chance to let us help you DOMINATE your competition! Step 4: Contact Us today and get higher Google rankings! The sooner you contact us (click here to do it) – the sooner we can get your website out of a Google penalty. When you contact us, we’ll do a free and complimentary analysis of your website and we’ll explain those details with you when we get back to you. Our prices are affordable, we can probably fix it in less than a few days, and we can make sure your website ranks higher and higher in Google search rankings and Google Map listings. Let us help you CRUSH your local competition today! What happens if you don’t get rid of your Google penalty? Well, the new Google Algorithm will begin to flag and penalize non-mobile friendly websites and your website will fall behind your competitors in local searches and local map rankings. You’ll lose customers and sales that you normally would have gotten. Your website traffic will slow to a stop as local “mobile-friendly” websites pass you by. CLICK HERE TO LEARN about the dreaded and deadly 2ND PAGE OF GOOGLE. That’s not a problem if you think you can survive without a solid online presence, but the way this area’s population is exploding – there will be less and less of a chance that local citizens will be able to find your store or business. …Especially when they’re searching on Google and your site is nowhere to be found. No other SEO or advertising agency has contacted you (or even knows enough) to warn you that your site is - and will continue to be - penalized by Google. Please know that we have literally 100s of first page Google results in Idaho. 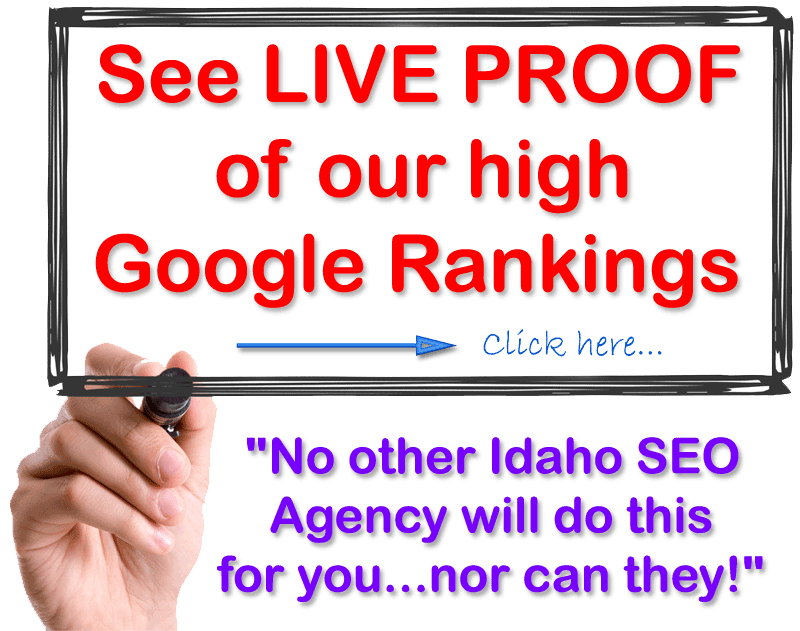 We also have earned 1,000s of first page rankings for our Idaho clients. Decide to contact us today. Let us get rid of your Google penalty and drive more traffic, sales, and revenue to your business!